As I read the reviews I have gotten about Time Pullers, I am reminded of an Aesop’s fable about a man, a boy, and a donkey. The man and boy were leading the donkey to market to sell, and some people they passed on the way criticized them for that. “Why lead the donkey when the boy could be riding him,” they chided. So, they continued on with the boy riding the donkey, until another group of people also criticized them. “Look at that lazy boy riding the donkey, making his father walk!” they scolded. So, the man and boy switched places. Later, another group also criticized, saying the donkey was big enough to carry both. So they tried that for a time, until the animal-rights people heaped shame upon them for abusing the donkey. Their solution was to carry the donkey by tying his legs to a pole that they rested on their shoulders. When they came to a bridge, however, the donkey became afraid and kicked and brayed until he ended up falling over the side. With only one leg free, and the rest tied to the pole, the donkey could not swim, and he drowned. The moral of this story is rather obvious: You can’t please all the people all the time. made it to the Top 100 of paid sci-fi books in the Time Travel category at Amazon. Here’s your opportunity to get this award-winning alternate-history time-travel adventure, absolutely FREE! May 1 through Cinco de Mayo, only! Watch for a giveaway of TIME PULLERS, coming soon! Time Pullers just had what may have been its best sales week ever. It went for a solid seven days without skipping a sales day. On one of those days it actually sold five copies! Now that may not sound like much to you, but for me, and Time Pullers, that’s a virtual “Black Friday” rush. Quite the little bump. Yea! Almost makes me want to start writing again. I saw the movie, “In the Heart of the Sea,” last night. This story has real historical significance, amazing videography, and will be of great interest to those who have an affinity for the days of the old sailing ships, but Ron Howard’s efforts to make this a block-buster with lots of special effects have been wasted. The IMAX theater, at 7 pm, had very few takers, and I predict that this movie will be eclipsed by Hunger Games, Star Wars, and various Krampus types of films. I would add that Chris Hemsworth is as much an unconvincing actor as his accent is unbelievable. One caveat for the squeamish: If you would be upset by the harpooning and lancing of cetaceans, albeit simulated, then you probably should choose another film. The ad ran for just over two months, at a total cost of $99.00. At times, I had to increase the bid to around $2.60 per click in order to compete for placement on pages. Three days in particular stood out for view count (impressions), where the counts exceeded 6000, 25,000, and 34,000. Typical days were about 1000 views, with the overall average just above 3000 views per day. As for effectiveness, who can say? I certainly sold more books while I was advertising, but I spent more, total, on advertising (in three different venues) than I have made (so far, over three months) on sales. I gave away far more books (494, if I remember correctly) than I sold, although quite a few people have read my book, or some part of it, via Kindle Unlimited. I also have thoughts concerning Kindle Unlimited, but that’s another subject for another time. For now, I’ll just say that, at 99 cents, I have to sell six copies to equal the royalty for one sale when I was using Kindle Select and pricing at $2.99. 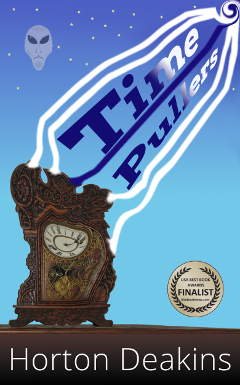 TIME PULLERS is now only 99 cents on Amazon Kindle!